Have you considered an egg? 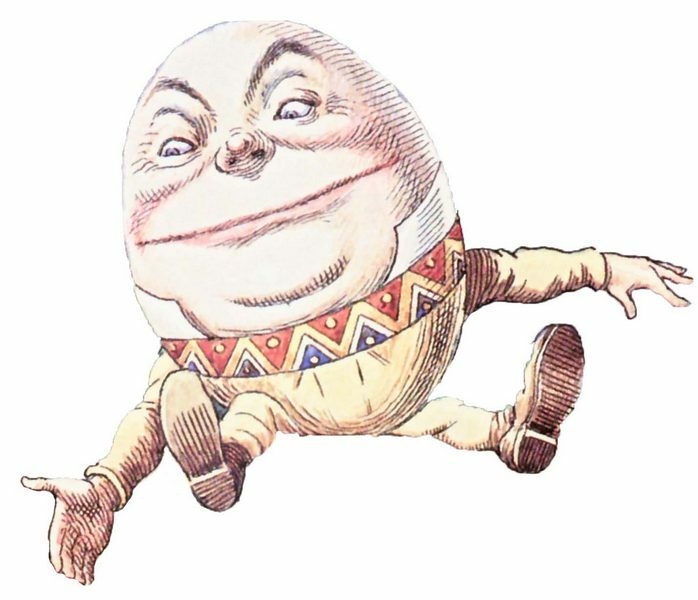 Consider Humpty Dumpty, the world’s most famous egg. I poached the following passage from Lewis Carroll’s Through the Looking-Glass (1872), where Humpty discusses semantics and pragmatics with Alice. What an egg-otist! Whosoever exalteth himself shall be abased. It’s no wonder Humpty Dumpty had a great fall. A long time ago I was a philosophy student at Otago University. And one exam time I was looking at some past exam papers and came across the following exam question: What is the meaning of a word? It’s a simple question with a simple answer. The meaning of a word is determined by the conventions that govern its use. This is no mere platitude. It’s philosophical orthodoxy and has been since David Lewis – ranked by his peers as the third most important philosopher of the twentieth century – published Convention: A Philosophical Study (1969). Platitude. Orthodoxy. Truth. The meaning of a word is determined by the conventions that govern its use. Alice is right. ‘Glory’ doesn’t mean ‘a nice knock-down argument’. You can’t make words mean so many different things. You can’t make ‘glory’ mean ‘a nice knock-down argument’ on your own, any more than you can determine the next government by casting a single vote. What’s more, one of the conventions that governs the use of the term ‘glory’ is the convention of correcting people when they use the word to mean something else. Our linguistic conventions have a built-in inertia that safeguards our very ability to communicate. Humpty Dumpty’s semantics was scrambled a long time before he met the same fate. It’s good advice. But, SOLO being the hive of hypocrisy that it is, well, you’d hardly expect its delusional denizens to take it, would you? No, you wouldn’t and they don’t. Recently, I’ve been following (one side of) a conversation on SOLO. An Objectivist said this. This has the more general form. What did you think I meant by ‘X’? I meant ‘Y’. To which I respond, if you meant ‘Y’, why didn’t you find the word or words which actually mean what you meant, and use those instead? To enter into a philosophical discussion is to commit to upholding certain standards of rational debate. It is inexcusable to say ‘X’ when you mean ‘Y’. I know, I’ve done it myself. I’ve said ‘X’ when I meant ‘Y’. And I’ve apologised. There is simply no excuse for not saying what you mean, let alone any entitlement to use words any which way. Why should other participants in the debate have to take time out to establish the meaning of your every utterance? It’s an imposition. There’s another problem. Words have meanings. Their meanings are determined by the conventions that govern their use. Their meanings are not determined by you on an ad lib basis as you see fit on any given occasion. Consider the case of someone who habitually says ‘X’ but means something else. (In other words, consider an Objectivist.) The Objectivist tells us he actually meant ‘Y’. But what does he mean by ‘Y’? Perhaps by ‘Y’ he means ‘Z’? This can go two ways. One is an infinite regress of stipulative definitions. The other is a regress that stops when the Objectivist tells you that what *he* actually means is the same as what the *words* he uses actually mean. But if the Objectivist is demonstrably capable of using words to mean what the words mean, as he is in the latter case, he is without excuse for not using words to mean what they actually mean in the first place. We use words to talk about reality. The constant redefinition of ordinary words that goes on in Objectivist circles has the inevitable consequence that the relations of reference that obtain between words and the world come unstuck. Ayn Rand described herself as an advocate of reason. I know what ‘reason’ means. I don’t know what Rand meant by ‘reason’ but I know what she didn’t mean. She didn’t mean reason. Previous PostGood without God?Next Post“Good without God” or “good with God”? It’s not just good advice, it’s Biblical advice. I just found out that it’s a footnote to Matthew 5:37 in the Holman Christian Standard Bible. But let your word ‘yes’ be ‘yes,’ and your ‘no’ be ‘no.’ Anything more than this is from the evil one. Ayn Rand came that they might have life, and that they might have it more abundantly. Objectivism is an edifice built upon Rands semantics… The redefinition of historic terms…Pre-loaded so as to render her opponents ‘evil’ and make *her conclusions* follow. Her ‘Bastardisation’/redefinition of such terms as Faith (as the abandonment of Reason), Sacrifice (as the betrayal of a higher value for a lesser), Altruism (as compelling others to sacrifice themselves to *your social ideals*), etc etc are all part of her insane delusion. That her methods appear to justify a deep hatred of Religion and religious people, and by claiming to having ‘discovered’ an Atheist foundation for Objective morality… She has created ‘an Opiate’ for Fanatical Atheists whom despise the Idea that they are duty bound to a Righteous and Judging God. A friend makes a good point and raises a valid concern. The good point is that many words have more than one meaning, i.e., they have different senses. I acknowledge this. It remains the case that the meaning of a word is determined by the conventions that govern its use. Our linguistic conventions are sensitive to context. For example, it is clear from the context of this comment that I just used the word ‘valid’ in its primary sense and not in its logical sense. In a way it is unfortunate that a word can have more than one meaning. If a word could never have more than one meaning there would be no fallacy of equivocation. And there would probably be no Objectivism and we could stop worrying and enjoy our lives. I say this because the majority of Rand’s so-called arguments rely on equivocation. Unfortunate, but that’s how it is. The valid concern is that my argument proves too much. “Your argument proves too much” is something you don’t want to hear when you’re presenting a paper in a philosophy seminar. It’s a subspecies of “shot down in flames”. Specifically, the concern is that I have condemned the practice of stipulative definition outright and that’s unacceptable collateral damage. 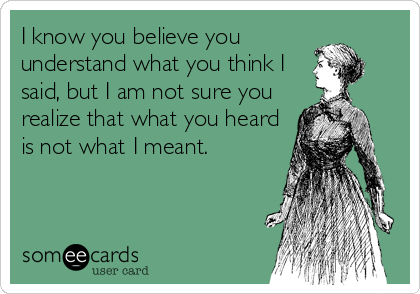 Stipulative definition is the practice of saying, “I’m going to use ‘X’ to mean ‘Y’,” and then doing just that. Stipulative definition is an inherently dangerous practice. Accordingly, our linguistic conventions carefully conscribe it. Stipulative definition is for the professionals, i.e., academic philosophers. Folks, don’t try this at home. Scope is an important and often overlooked consideration. Here’s an example. In A Theory of Justice the philosopher John Rawls gives a stipulative definition of ‘right’ (as in human rights). That’s all well and good. But what happens in the book stays in the book. Outside the scope of his work, philosophers do not use the term ‘right’ in the sense of Rawls’s definition. The speak instead of Rawlsian rights. Thereby avoiding ambiguity and minimising the risk of downstream equivocation. Clarity is a cardinal virtue in philosophy. Stipulative definition is a privilege, not a right. If you’ve got a sufficient degree of philosophical nous, then stipulate away. If not, you have no business stipulating. You don’t know what you’re doing and you’re a menace to the mind. Ayn Rand abused the privilege utterly. Nearly every key term in her philosophy is stipulatively defined. The conventions that govern our use of stipulative definitions demand that any use of a word stipulatively defined is preceded with the appropriate disclaimer, i.e., “In what follows, I use ‘X’ to mean ‘Y’. Rand rode roughshod over this convention with cavalier contempt. Objectivists might protest that in the context of an Objectivist forum all such disclaimers are implicit. It’s a feeble excuse and a dishonest one. Rand’s mind-killing spree of stipulation is a prelude to equivocation. That’s its whole point. And it’s not as if Objectivists restrict their use of everyday terms (such as the ones Tim mentions in the previous comment) in the Randian sense to their conversations within Objectivist circles. They speak impenetrable Randian gobbledygook in non-Objectivist contexts too. Notwithstanding the fact that when she was good, she was very, VERY good (and we owe her one for recruiting so many to the libertarian cause), Objectivism is a form of demonic possession and Rand was a prize minion of the Father of Lies. – From Richard Bandler, inventor of Neurolinguistic Programming.